Looking for something to read while waiting for the next Harry Dresden book? 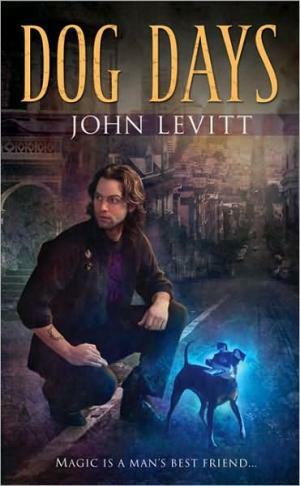 John Levitt’s Dog Days series might suit. This urban fantasy series is set in present day San Francisco, a setting that is captured well in the story’s narrative. Our hero here is Mason, a magic practitioner, who once served as a sort of “cop” to keep other practitioners in line, but has since given this up in favor of his other passion: playing jazz guitar. Improvisation is Mason’s specialty both in his music and his magic. When someone tries to kill him, Mason is drawn back into helping the enforcers track down a black practitioner. What sets this one apart from other similar series is Louie. See the miniature pinscher on the book cover? That’s Louie. Mason’s Ifrit. Kind of like a witch’s familiar, but not quite. In Levitt’s series, not every practitioner has an Ifrit, but these intelligent magical creatures assist their chosen practitioners. I find this series lighter in tone than the Harry Dresden series, but still quite engaging. The story is well paced and plotted, though at times it seems the characters don’t consider things you’d expect them to. I really enjoyed the book’s climax and liked how Mason’s improvisation skill is unique. Also, the author does a fine job of describing Mason’s music which adds to the story as a whole. As a debut novel, Dog Days is imaginative and a good foundation for reading more. For more about the Dog Days series, check the author’s website here.